Available to ship: Next Business Day. The PL96e is a high-power, intelligent linking battery, and part of the PAGlink system. PAGlink batteries can be used individually or linked to power a variety of cameras including: standard or high-definition broadcast cameras, 4K digital cinema and 3D camera set-ups, DSLRs and handheld camcorders. PAGlink is the only system that allows you to combine the capacities of more than two batteries, in any state of charge, to achieve longer run-times or a higher current-draw capability. Up to eight batteries can be linked for charge or discharge - an industry first. An individual PAGlink battery has a capacity of 96 watt-hours, making it unrestricted, in quantity, for air transportation. Linking two batteries doubles the capacity to 192Wh; three batteries provide 288Wh. No other system offers as much power. Hard-wearing, heavy duty contacts are incorporated for high-current applications. The rated maximum continuous output is 12A when linked (8A individually). Other manufacturer’s so-called high-current technology offers only 10A. Linked batteries form a high-speed network that enables them to communicate with each other, managing the output safely, and preventing the transfer of charge between batteries. Unlike other systems the linked batteries can be in any state of charge. PAGlink also allows batteries to be hot-swapped for constant, uninterrupted power. As well as being smarter, PAGlink batteries are smaller and lighter, with a higher energy density than any V-Mount system marketed to date. PAGlink batteries feature long-life, premier-quality Li-Ion cells, which have no memory effect, and are completely recyclable. In keeping with PAG’s total battery design philosophy they are designed and constructed to provide the longest possible working life. The battery case is manufactured from high-impact, injection-moulded polycarbonate which is inherently very strong and also used for motorcycle crash helmets. The internal case design also protects the cell-pack against damaging impact. A built-in 5 LED run-time and capacity indicator shows remaining camera run-time in hours and minutes. When linked, run-time is displayed for the total of all batteries connected. Battery state-of-charge is displayed as a percentage, in 6 increments. The display maintains its accuracy by tracking the performance, and adjusting calibration values to compensate for the ageing of the cells, and does not require a periodic ‘service’ charge. A PL96T can be linked to the PL96e battery to provide a numeric display of remaining run-time for all linked batteries. PAGlink batteries support four different camera data systems that display capacity in the viewfinder: Sony, IDX, Red and Anton-Bauer. The battery recognises the system’s data protocol and adapts automatically when connected. The battery can be configured easily for compatibility with the Red Epic/Scarlet camera data system by the user (see instruction booklet). PAGlink batteries store data in their microprocessor, such as number of cycles and software version, which can be revealed using the PAGlink Battery Reader (Model 9647). This information is designed to assist with the management of a large battery inventory. PAGlink batteries are firmware upgradeable. The program can be updated in the field by the user, in a matter of seconds, without opening the battery case. A software update can be supplied by PAG or your dealer. Updates enable you to benefit from the technological advances that PAG introduces to accommodate developments in camera technology. When using a PAGlink charger, batteries in any state of charge can be linked for charging. The new, 2-position PL16 charger (Model 9707) will simultaneously charge up to 16 PAGlink batteries (8 on each position). 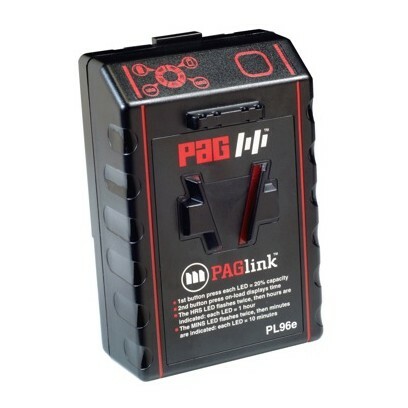 Alternatively, PAGlink batteries can be charged individually or linked, using any reputable V-Mount Li-Ion charger. The batteries must be in a similar state of charge (within 40%) in order to be fully charged when linked. The battery’s advanced electronic protection system is fail-safe and guards against conditions that reduce battery life. It features circuits that are Parylene coated to make them resistant to electrolyte. Enhanced low temperature performance allows PAGlink batteries to operate at minus 20°C. The PL96e has been independently tested in accordance with UN standards and certified to comply with air transport safety regulations. Its capacity is below 100 watt-hours and it is therefore suitable for air transport on passenger aircraft, in hand-luggage, without quantity restriction.